New Gonzaga women's head coach Lisa Fortier. After 14 years of Kelly Graves making calls as head coach, the Gonzaga women's basketball team begins their 2014-15 season led by a new, though familiar, face. 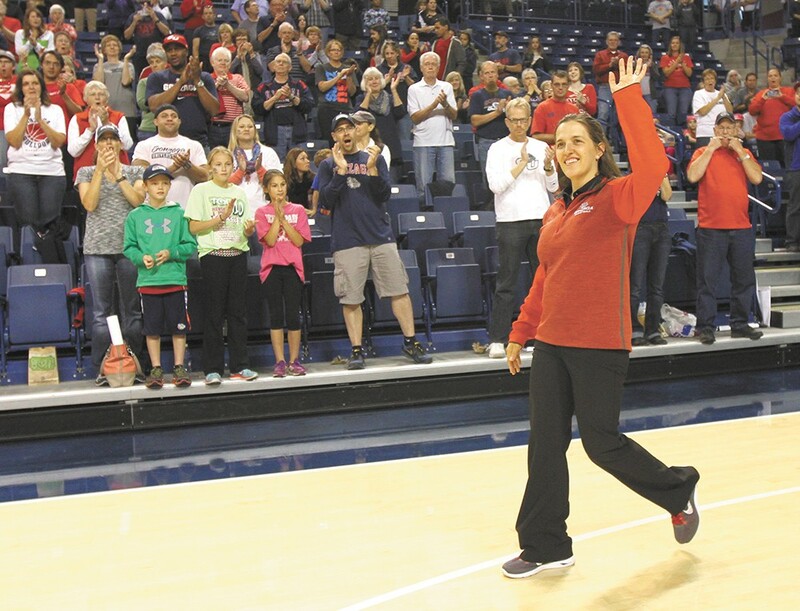 Beginning at Gonzaga as the coordinator of basketball operations from 2004-06, Lisa Fortier spent a year as an assistant coach at the University of Northern Colorado, and has since been an assistant coach for the Zags the past seven years. Fortier's experience with the program has helped inform her approach to her new role since Graves announced his acceptance of the head coach position with the University of Oregon's women's basketball team in April. Fortier's new title gives her the control to tweak aspects of her players' games she previously could not, but also challenges her to make bigger decisions. "In the past I've focused more specifically on guards and defense, but now I have to think more big picture," says Fortier, who brought her husband, former Eastern Washington women's assistant Craig Fortier, on to her staff. Graves' and Fortier's coaching styles are slightly different, but Fortier is confident that with the talent the Zags have this season, they have the potential to make a deep tournament run. "We've always had high expectations for the girls on and off the court, and that will still be the same," she says. Fortier expressed only gratitude for the GU fans, and that they are largely to thank for her transition to head coach feeling so natural. "There's nothing like the support we have," she says. "It's better than the support for most men's basketball programs in the country." With what they've accomplished, it's no wonder why their fans are so passionate. Graves coached the Zags to three consecutive Sweet 16 appearances from 2010 to 2012, advancing to the Elite Eight in 2011. Last season the Zags won their 10th consecutive WCC regular-season title and sixth WCC Tournament title overall. "Change can sometimes be hard to make," Fortier says. "But I've gotten over the part where it's scary, and now it's just exciting." The Zags tip off their first game of the regular season Nov. 16 at 2 pm against Dayton, airing on SWX and on local radio 1050 AM. As a rule, you don't want your Division I basketball team to give up 115 points in a exhibition game against a lowly opponent. Though not the best note on which to start the season, it's not too bad if you're able to score 139 points of your own. The box score of that 139-115 win over British Columbia's Simon Fraser University is enough to make any number-crunching basketball fan's head spin, thanks to Division II SFU's new press-all-the-time, NBA Jam style of play. But fear not, Vandal fans; that anomaly is hardly a harbinger of things to come for Idaho's first season in their return to the Big Sky Conference after leaving in 1995. Although picked to finish seventh in the 12-team conference, keep in mind that Idaho was one win away from heading to the NCAA tournament last year after a hard-fought run through the WAC tournament. The Vandals lost last year's leading scorer, Stephen Madison, to graduation, but return three starters from that squad, including senior Connor Hill, a Post Falls native who broke the Idaho career record for 3-pointers made last season. Sekou Wiggs comes back to play the other guard spot. Down low, they'll rely on senior Bira Seck and a number of fresh faces new to the program. It looks to be a feisty team that won't be giving up 115 points again anytime soon. The Vandals start the season with games against Eastern Oregon on Friday and South Dakota State on Monday. Both of those contests are slated for 7 pm at Idaho's very cozy Memorial Gym. The Eagles were itching to get their basketball season rolling. So much so, in fact, that they'll be playing for-real, this-counts-toward-the-postseason basketball on Friday morning while you might still be in your pajamas. After starting their football season a week before the rest of the country — thanks to a made-for-ESPN game in Cheney — Eastern Washington's athletic department is apparently looking to build on its reputation for punctuality by tipping off against Texas Southern at 8 am on Friday, making it the first NCAA non-exhibition contest in the country. Appropriately, the first 250 drowsy co-eds who populate the stands at Reese Court are promised free slippers. "Our team is eager to start the season against a quality opponent," Eastern Washington head coach Jim Hayford said upon the announcement of the early tip time. "Why not play first? I hope EWU fans will take advantage of the unique time and come support the team." Hayford's Eagles might have reason for their eagerness to hit the court. The squad that went 10-10 in conference play but still missed the Big Sky Conference tournament is returning four starters, which is why they ended up at No. 2 in the conference's preseason poll. If Eagles fans need a reason other than those free slippers to watch this squad, Tyler Harvey alone might be enough this year. The junior guard averaged 21.8 points a contest last season, which included insane performances like his 38 points (with 10 3-pointers) against Northern Colorado. He's getting much-deserved preseason attention from national publications and should anchor an offense that includes Australian Venky Jois, Drew Brandon and Spokane's own Parker Kelly — all of whom averaged 10 or more points last year. Whitworth's athletic department released an incredible figure last week: The Pirates men's basketball team has won 128 of its past 147 games. If you're into math, you know that's an 87 percent winning percentage during that stretch. With the exception of only one season, the Pirates have either won or tied for the Northwest Conference championship every year since the 2006-07 campaign. As we've been saying for a few years now, the Gonzaga men's and women's programs aren't the only dominant college teams in Spokane. You can find some intimate (the Whitworth Fieldhouse seats just 1,620) and affordable ($10/adults, $5/seniors) hoops among the pine tree-filled campus in North Spokane. This year's squad is looking to reload after making it into the NCAA Division III tournament on the strength of guard Dustin McConnell, who has since graduated. Guard George Valle, who returns for his junior year, should be able to improve on his 9.6 points per game last season. Additional scoring could come from Christian Jurlina, a forward who came off the bench to average almost 11 points. Big man Taylor Farnsworth, from Spokane's Mead High School, will anchor the defense.